Three different brushes, endless applications, and methods! The Variety Color Brush Set offers you limitless applications and methods, so go ahead and create something beautiful. 1 NEW Extra Wide sized brush for more application. Exceptional for root touch ups! 1 NEW Medium sized Precision brush with metal pin tail. Time to power up and power through your color applications with the new Power Painter. A great tool for saturation and larger applications of color as well as feathering, blending and balayage. So with all these great ways to use the Power Painter the only question is, where is yours? 1 Black Brush & 1 Pink Brush, both with Ergonomic Handles for prolonged use. Incredible for Hair Painting and blending. Faster application with bigger surface coverage. The Framar Triple Threat Set offers three medium sized brushes in different colors, the perfect bristles, and endless applications! These brushes have the ultimate precision, especially for balayage or hair painting applications! 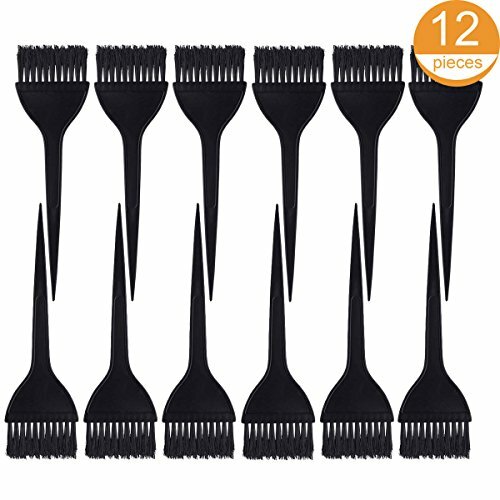 The AccuSoft bristles are tapered which allows you to actually paint lines on hair. With the perfect combination of softness and stiffness, you're always in control when coloring with these bad boys. A COLORISTS MAGIC WAND - You are an artist, and your color brush is something you use everyday, why not have the best? Never have to worry about borrowing your coworkers' brushes again! 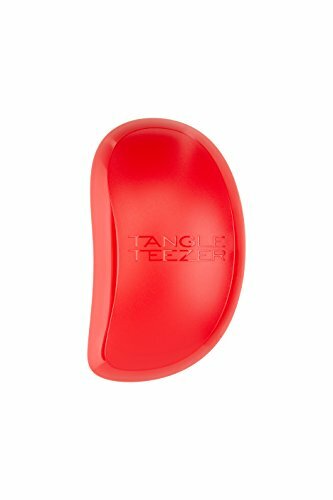 MULTI PURPOSE - Perfect for Balayage, hair painting, highlights, or even painting thin detailed lines! HIGH QUALITY - Tapered edges for ultimate precision and fine lines, giving you the worlds best color brushes. Made with our AccuSoft Bristles, which gives you the perfect blend of soft and stiff for optimal control. 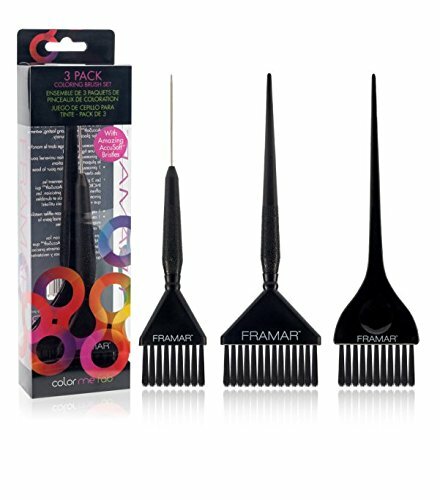 EASY APPLICATION - 3 medium sized brushes for ultimate precision, especially for Balayage applications! 2 Flat brushes, and 1 angled brush. VARIETY OF COLORS - 1 Black brush, 1 Pink brush, and 1 Purple brush. 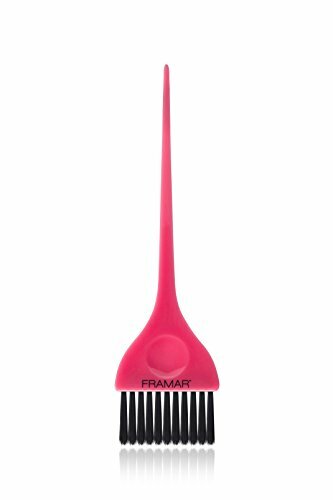 Colortrak specializes in a line of vibrant, comfortable and effective professional salon products including everything you need for styling, coloring and processing applications. Create professional hair color looks with ease with Colortrak's Wide Hair Color Brushes. Each brush features stiff, rounded, contoured bristles for smooth color application without fray and a thumb groove for easy handling. Brand: Colortrak | Manufacturer: Betty Dain Creations, Inc. Introducing the catalyst of the company, a single color brush. This was the brush that started it all. No longer do colorists want any color brush, they want the color brush. 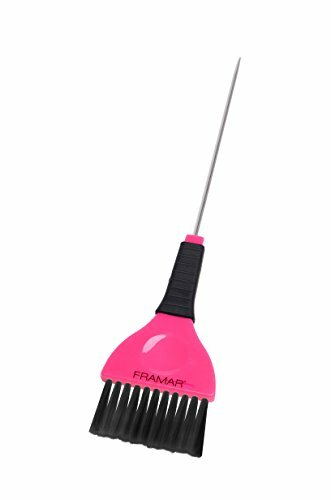 Introducing one of the most critical tools in a colorists station, the Framar Color Brush. The Classic Framar Coloring Brush. The worlds best color brush. Added pin tail for precise sections, working as two tools in one. Fantastic 2 in one brush for foiling. Tapered edges for ultimate precision and fine lines. The worlds best color brush. Grip provides extreme ease of use and comfort for the hand. Also prevents slippage. 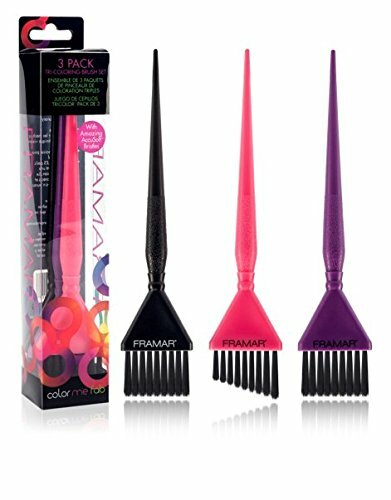 The Framar 2 Pack Bowl Set is the perfect combo for your hair coloring needs! These mixing bowls are perfect for both coloring, or keratin treatments. They allow you to mix all chemical treatments safely and easily. They're washable and reusable, have durable construction, and there is no chemical reaction or stains with hair dye. They allow for easy mixing and application of any hair color, whether you're a beginner or an expert. Bowls have a non-slip rubberized bottom to prevent any hair color from tipping. Built in teeth to help remove excess color and keep your color brushes clean at all times. Easy pour spout and inside measurement markings to see exactly how much you have inside. Essential hair tools for the salon. Let these bowls save you time and money behind the chair! Perfect for coloring products at the salon, studio, or at home. Especially for those who want multi colored hair. Essential accessories for coloring hair! Set of two hair tint bowls. Both have Inside measurement markings and an easy pour spout. A necessary mixing bowl set. Sturdy with non-slip rubber bottom, so don't worry about hair color spillage. Easy to clean and store; could be cleaned up nicely by rinsing with water for multiple uses. These bowls are excellent for mixing developer with hair dye, hair bleach, and hair toner. Perfect for your arsenal of hair tools at the hair salon. Brushes not included. Teeth on each bowl to help remove excess color from the brush. This will save you from wasting hair color, and keeping both your coloring brush and station clean at all times! Although technique and process are important, sometimes size matters; or so we are told ;) The new and improved Board and Paddle Set now offers a larger peach paddle replacing its pink predecessor. Now that is a paddle. 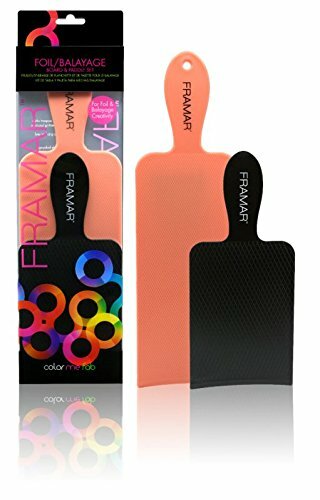 The Framar Board/Paddle Set is essential for balayage, highlighting and free-form coloring. This short and long paddle pack is perfect for all hair types and colors, and fantastic for balayage. The highlight board makes adding lights much easier to get color all the way penetrated through. They help you achieve a flawless blended look and save times having the product right there in your hand. They provide the optimum coloring application and achieve the ultimate balayage look. Both boards provide excellent support for your free-form hair coloring. Very useful tool when applying keratin to your hair and make a great addition to your hair bleaching kit or hair dye kit. Can be used with any hair lightener. Your favorite new balayage board/paddle combo is here and ready for you! GREAT STABLITY - The highlight board features a slight curve on two sides to better suit head shape and a handle that allows for comfort and stability. This allows you to work as closer to the client's head as possible. IDEAL SIZING - 6 x 4.25 and 9.25 x 4 working surfaces to choose from, allowing for extra-long coverage with the large paddle board (peach) and shorter one (black). Fantastic for applying Hair Color or Hair Bleach. DURABLE - Integrated handle for comfortable maneuvering. Strong base for painting and bleaching hair, especially those with long hair who needs stability. This board could also separate the hair from the rest of your hair and makes coloring much easier and neater. Sturdy and the way the bristles are cut actually really helps with coverage and not getting as much hairs stuck in the brush, and clean up nicely to reuse. ADDED TEXTURE - With both a smooth and textured side, the one side has a Diamond texture for an improved grip on the hair, while the smooth sides are great for padding the brush and testing color before you apply it to the hair. Just pull the hair you want to color over the board to get a firm foundation to paint on, since it has a grooved side for gripping the hair and pulling it tight so you can get an easy, straight section of hair for applying color or bleach. EASY TO USE - The board and paddle make balayage that much easier for the hair colorist so you can focus more on the quality of your art. Fantastic addition to your arsenal of hair tools or hair bleaching kit. Can be used with any hair dye. 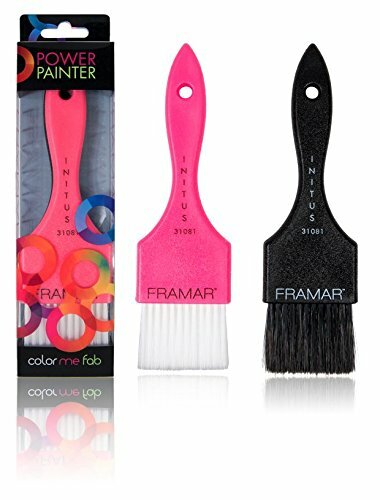 Three wide sized brushes in different colors, endless applications, and methods! The Big Daddy Color Brush Set offers you limitless applications and methods, so go ahead and create something beautiful. Also fantastic for balayage. EASY APPLICATION - 3 NEW Extra Wide sized brushes for more application. 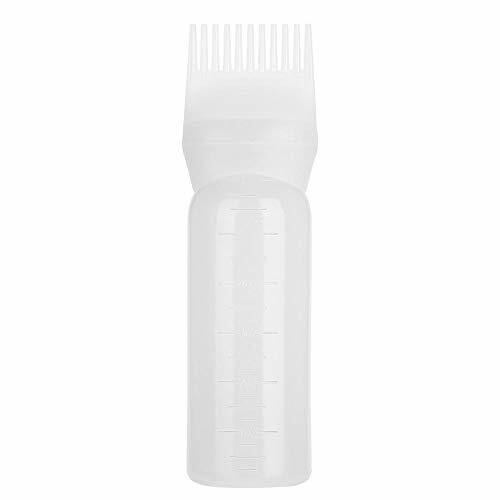 MULTI PURPOSE - Perfect for all color applications, and exceptional for root touch ups! HIGH QUALITY - Tapered edges for ultimate precision and fine lines, giving you the worlds best color brushes. Flat tail section for added grip and ease of use for wrist. AccuSoft Bristles that allow you to glide through color. Comb allows for quick parting or sectioning of hair. Side angled color brush with integrated comb for back combing and easy sectioning. Tapered edges for ultimate precision and fine lines. Worlds best color brush. Ergonomic, use the brush vertically for precision or horizontally for larger applications. Finger control groove for ultimate maneuvering. Introducing NEW Color Intensity Color Butter...brilliant, ultra-moisturizing hybrid to amp up the richness of high-beam hair color or add a pop of color to blondes who want to shake things up. Parched strands become completely quenched, gloriously glossy, and silky to the touch; that's because Color Butter strengthens weak, pre-lightened hair, restoring vital moisture levels that leave hair frizz free and amazingly responsive to styling. As for color? The sky's the limit: Extend the life of your hair color investment shade for up to 10 shampoos with our unique rainbow pigments: GREEN, BLUE, TITANIUM, PURPLE, RED, and PINK give you the freedom to touch up dipped tips or even create whimsical pinwheels in a flash! The possibilities are endless. Color Butter offers a rich-yet-weightless treatment that gives you the pop of a temporary color with intense conditioning benefits. 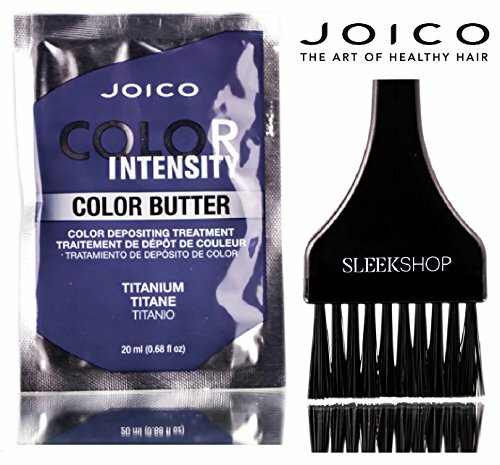 Formulated with Joico's state-of-the-art technology-including restorative Arginine, and powerful Bio-Advanced Peptide ComplexTM to strengthen and repair hair-Color Butter is designed to fuse fun and fashion with serious care. 1. Intermix each shade for strong, bold and artistic customized shades. 2. Intermix any shade or customized formula with your favorite Conditioner like K-PAK Color TherapyTM or Moisture Recovery to dilute or lighten the intensity a shade. 3. Deepen your Color Butter shades by repeating an application 2-3 times. Apply your first application, process, and rinse the hair. Repeat this process 2-3 times to deepen your color butter result. 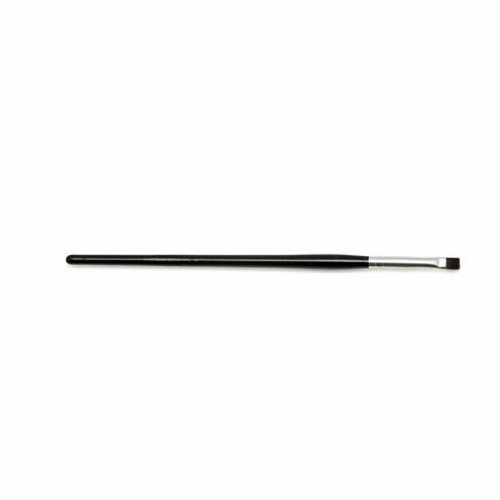 includes a Sleek Tint Brush for easy application and easy mixing of colors! As for color? The sky's the limit: Extend the life of your hair color investment shade for up to 10 shampoos with our unique rainbow pigments: GREEN, BLUE, TITANIUM, PURPLE, RED, and PINK give you the freedom to touch up dipped tips or even create whimsical pinwheels in a flash! The possibilities are endless. 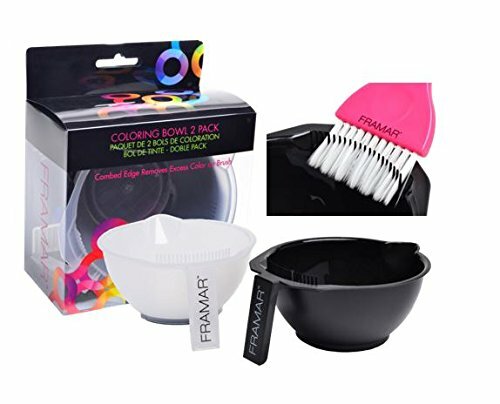 The Framar Connect & Color Bowl 7 Pack Set is the perfect combo for your hair coloring needs! These mixing bowls are perfect for both coloring, or keratin treatments. They allow you to mix all chemical treatments safely and easily. They're washable and reusable, have durable construction, and there is no chemical reaction or stains with hair dye. Each bowl perfectly connects into each other, making it super easy to hold all 7 bowls at one time. They allow for easy mixing and application of any hair color, whether you're a beginner or an expert. Bowls have a non-slip rubberized bottom to prevent any hair color from tipping. These are essential hair tools for the salon, and could even be used for guacamole as a fun dip with different spreads! Perfect for coloring products at the salon, studio, or at home. Especially for those who want multi colored hair with all the different bowls. Essential accessories for coloring hair! 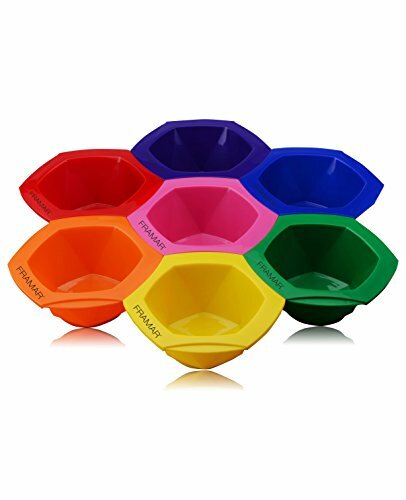 Set of six interlocking hair tint bowls. Create the perfect palette of colors for your next hair masterpiece. Your hair color bowls should be as fun as your hair color. Use a couple, or use them all! All the bowls in this mixing bowl set stack up on top of each other, making them easy to take on the go. These bowls are excellent for mixing developer with hair dye, hair bleach, and hair toner. Perfect for your arsenal of hair tools at the hair salon. Can even be used as a paint color palette for your kids! Every mixing bowl is made of stain and shock resistant material. The perfect bowl set! This hair brush is professional limited edition hair brush detangle wet and dry hair without any tugs or pulls boasts an innovative centralized concave design. Features: You can dye your hair at home fast, safe and easily. Fill this unique brush with your color of choice, turn on and presto. The color control system distributes color with precision and ease. You'll be amazed just how fast and easy it is. Professional salon results at home in half the time. Mini size, you can take it for traveling. You can dye your hair very fastly. Descriptions: The hair color of your choice Say good bye to expensive hair salons that charge a fortune to change your hair color! 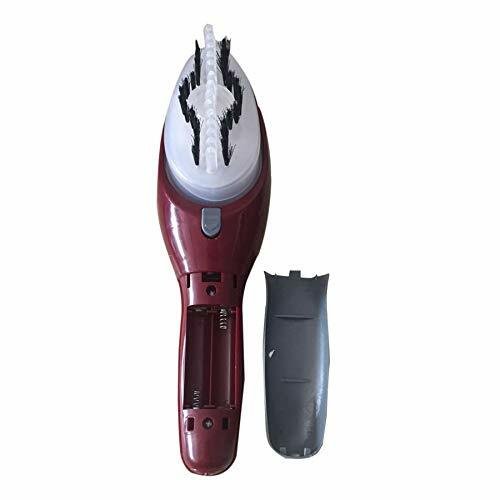 Durable enough for your daily use Specifications: Size: 27*13.5*9cm Color: red&black Material: plastic Power: 2 x AAA batteries Package included: 1 x Hair Coloring Brush Notes: Please allow 0-2mm error due to manual measurement, thanks for understanding. Due to the difference between different monitors, the picture may not reflect the actual color of the item. Please understand, thank you! You can dye your hair at home fast, safe and easily. Fill this unique brush with your color of choice, turn on and presto. The color control system distributes color with precision and ease. You'll be amazed just how fast and easy it is. Professional salon results at home in half the time. 1. Made of quality plastic material, durable and safe to use. 2. Great tool for hair dyeing use. 3. Attached with a comb, more easier for hair dyeing than traditional way. 4. Suitable for both professional use or home DIY use. 5. Bottle with scale, easy to mix hair color potion. 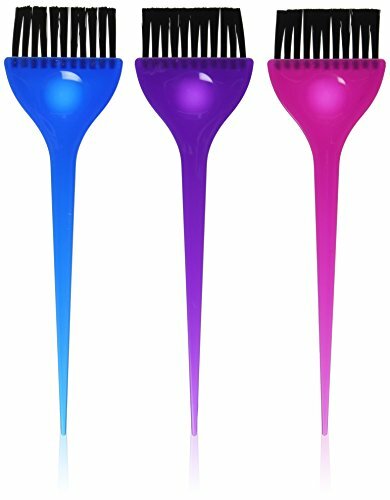 GRADUATED SCALE This hair brush teeth is smooth to disentangle your hair, the scales on the bottles is convenient to know how much hair dye you have filled. PREVENT CHAOS This product helps even distribution of your hair dye and massively prevents the mess involved. PUMP HANDLE Simply fill the dye bottle with your color and press the pump handle to get the dye coming through the comb head. HIGH-QUALITY MATERIALS Made of top-quality PP material, durable, eco-friendly and harmless. MULTIPLE USES It is very suitable for professional hairdressing salon use and domestic use. 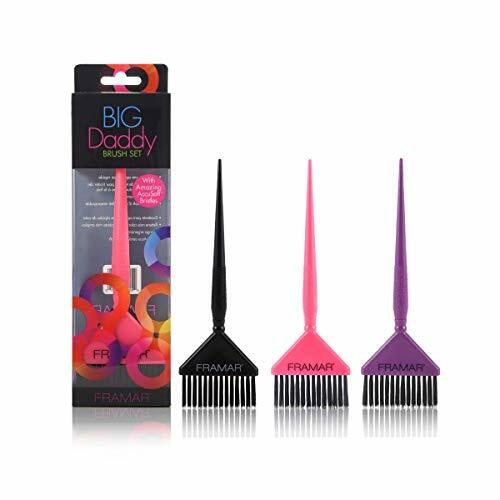 Versatile its brush hair is soft and its comb has smooth teeth, while tail is great for sectioning. 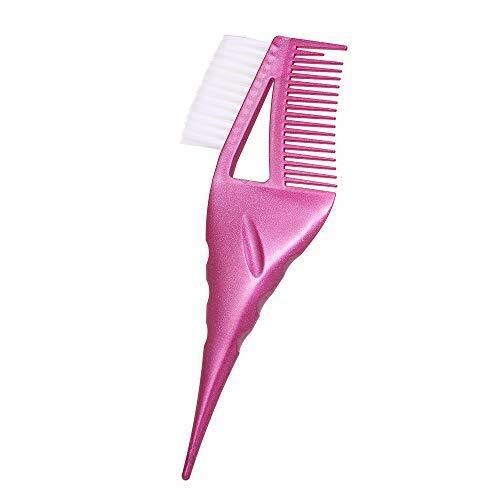 helpful for coloring hair roots You can use it to spread the hair dye cream then comb it through,.Great for salon hairdressing use and home personal use, a perfect and necessary accessory for DIY hair dye. 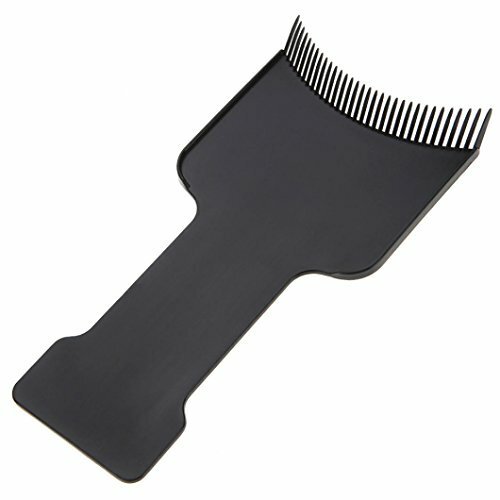 Made of top grade plastic and fine fiber hair sturdy and durable, can be used for a long time. Ergonomic design comfortable and to hold and easy to use, works well for you. Good Shopping Experience We are striving for the best quality product and customer experience.If there are any questions BEFORE or AFTER purchasing,please let us know in advance, so we can take care of any issues first. 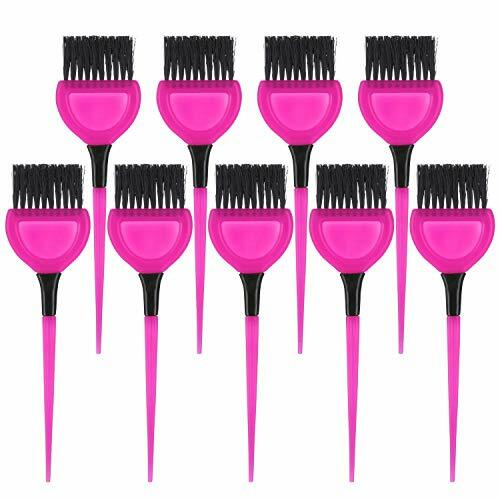 This Hair Dye Applicator Brushes Set includes 5 pieces hair dye brushes, meeting your need for dyeing different colors at one time. Dense fine flexible bristles makes coloring much easier and helps efficiently catch more hair dye and evenly spread on your hair. 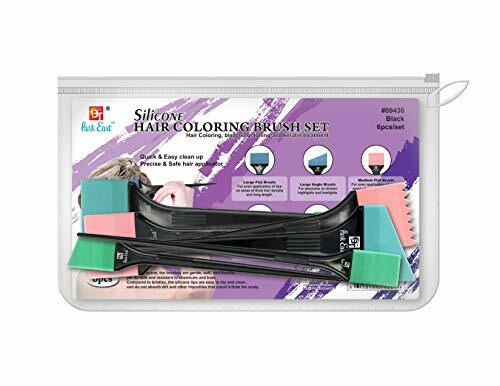 Made of Slicone, the brushes are gentle, soft, and flexible. Durable and resistant to chemicles and heat. 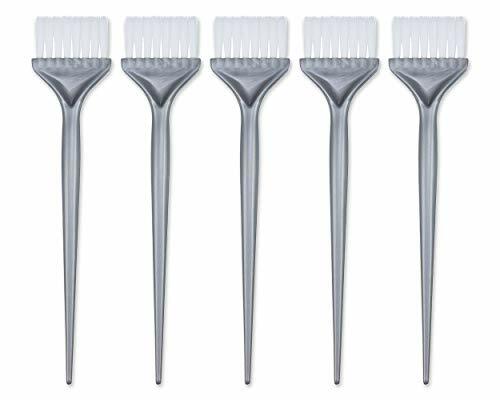 Compared to bristles, the silicone tips are easy to dry and clean, and do nit absorb dirt and other impurities that could irritate the scalp. *SMALL FLAT BRUSH- For even application of dye on areas of thin hair density and short lengths (buzz-cuts, eyebrows) *SMALL ANGLE BRUSH- For precision on thinner highlights and low-lights.